We’ve all seen “that house” — the one with a roof that draws people’s eyes from down the block. While it isn’t a choice likely to keep you up at night, choosing the color of your roof is nonetheless important. It affects not only the aesthetics of your house but your ability to sell it later on. When choosing the color of your shingles, there are four things you need to keep in mind: location, humidity, siding color, and efficiency. First consider the proximity of trees to your house. If a tree grows directly next to your home or hangs over the roof, it will drop leaves, pinecones, seeds, sap, and branches on the roof. As these things collect on your roof, they will stain it with tannin. These stains, of course, will show up on lighter-colored shingles. 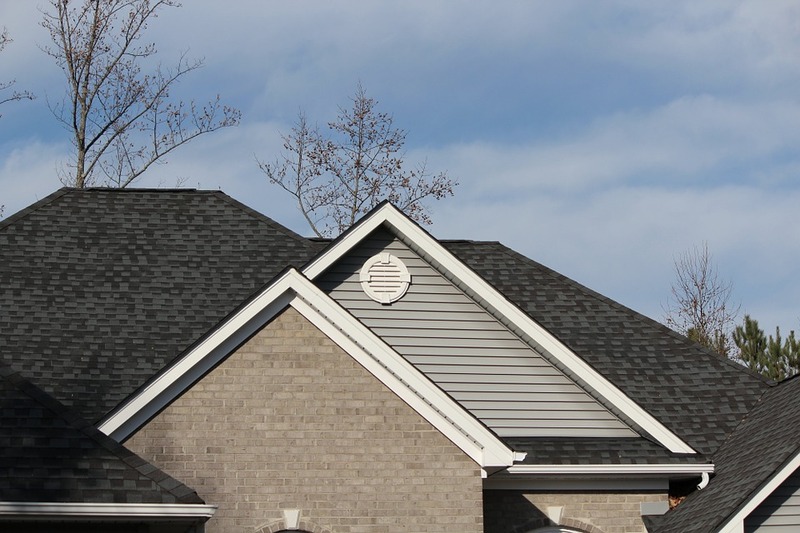 Consider darker shingles if trees overhang or grow near your roof. You’ve likely seen houses with long, dark streaks on their roofs and wondered what caused the streaks. While it may appear that smoke or an accident caused them, they’re actually from algae. While not pretty, algae grow naturally on roofs that don’t receive enough sunlight and which are built in a humid environment. And while some shingles come with metallic granules that resist algae from forming, they cannot stop algae from ever growing, especially after the shingles have been on your roof for more than 10 years, despite warranties. If you live in a humid environment or if your roof does not get much sunlight, consider purchasing darker shingles. While a lighter roof may look prettier when first installed, it may not look as good as it ages. Perhaps the most obvious thing that will determine the color of your shingles is the color of your house’s siding. Look for a color that complements — and does not clash — the siding. Roofs are not typically a place where homeowners want bold colors. And a poorly chosen shingle color can make it difficult to resell your home down the line. To choose a color that complements your siding, you will have to make a good aesthetic choice. Green, for example, will not complement a house with blue siding. In general, go for a neutral color if your house already has brightly colored siding. Also keep in mind that high-contrast and light-colored shingles will highlight features — and defects. Low-contrast and darker-colored shingles will do the opposite. Out of all the things you need to keep in mind when choosing shingle color, energy efficiency is actually the least important. Ventilation and insulation in your attic affect your utility bills far more than your roof color. This is because insulation separates the air in your attic from the rest of your house, air which can (or should) vent outside. Shingles, therefore, should not make much difference in indoor temperatures. They can, however. If your house lacks insulation and ventilation, your shingles will have a more dramatic effect on indoor temperatures. In this situation, consider whether your energy costs during hot and cold seasons. Whatever season it costs more to heat or cool your home, choose a shingle color that will make the biggest difference. Darker colors absorb more heat, which increases the temperature in the attic. It can also help melt rooftop snow during winter. Light-colored shingles do better in hot climates because they reflect light and keep attic temperatures cooler. For help choosing a shingle color, contact E3 Roofing and Remodeling. We’ll work with you to choose a color that best works in your situation.